Nested deep in the Gulf of Mexico, a mere 67 nautical miles west of Florida’s Key West, lies the Dry Tortugas, a seven mile stretch of pristine low-lying islands comprising of the Dry Tortugas National Park. So what makes them so unique? They draw thousands of visitors every year not just because they look like photo essay out of Condé Nast magazine, but because they are some of the most geographically unusual islands in the world. To put it into perspective, a mere 93 acres of the National Park’s hundred square miles (some 64,000 acres), is actually above water! The other unique feature about this collection of seven low-lying islands is that they’re home to some of the most robust coral reefs thriving off of any North American coastline. In contrast to its idyllic setting, right at the centre lies Fort Jefferson, a historical fortress from the 19th century, jutting abruptly out of the horizon. This blend of geographical oases, exotic array of flora and fauna (more on that later) and interesting history makes the Dry Tortugas a must-do for anyone vacationing in Key West. The keys, individually named, each have their own unique characteristics. Bush Key, for example, is home to a selection of fauna including mangrove, sea oats, sea grape, bay cedar and most interesting, prickly pear cactus reminding a discerning visitor of this tiny island’s desert nature. At the very end of the chain lies the 49-acre Loggerhead Key, a sliver of land, patched with grass, and home to an lighthouse built in 1858. The island’s was given its name by Spanish explorer Juan Ponce de León, when he first stepped foot on the islands in 1513. He noted the warm waters were abundance with loggerhead, leatherback, and hawksbill turtles and appropriately named the islands las tortugas. Over the course of three decades, pirates would come to the Dry Tortugas to pilfer turtle eggs, and use adult turtle meat as currency for trade. Unfortunately, while the Dry Tortugas were an attractive destination for marauding pirates, they were also the site of some 200 shipwrecks before the construction of the lighthouse on Loggerhead Key. As history marched on, the Dry Tortugas became home to a 1,500 man fortress on Garden Key. The fortress became a prison for Union deserters during the Civil War, it’s most famous prisoner being Samuel Mudd, the man who was convicted of conspiracy in relation to the assassination of Abraham Lincoln. Samuel served four years for setting the broken leg of the John Wilkes Booth, the man accused of murdering Lincoln. It’s hard to believe that this collection of tranquil, idyllic looking islets could hold so much history, but with the Florida Keys and the Caribbean mere miles away, it certainly puts history in perspective. 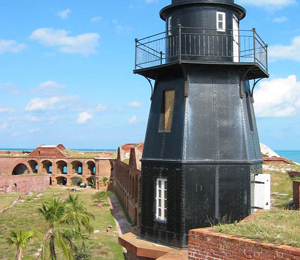 If you happen to be spending any time in Key West, be sure to carve out some time to visit the Dry Tortugas. It’s magic and intrigue will have you mesmerized, and with a pocket full of memories to take back with you, it will surely be a destination you will soon not forget.